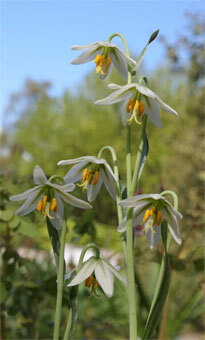 A delightful later flowering Fritillaria with delicate cream pixie hat flowers native to California. It prefers a sheltered sunny position in gritty soil or trough. Its leaves appear very early on in the spring. 12cm tall. Plant 4cm deep.